On the Winter Solstice, Issue 5.1 of the Alaska journal Cirque went live. Available both online and in print, Cirque features writers and artists living in the North Pacific Rim region. I have a poem, titled “At Mt. Baker, October,” published in this volume (p. 49). My thanks to editors Mike Burwell and Sandra Kleven for selecting my poem, and for showcasing all the work in the journal so beautifully. Cirque is a gorgeously produced literary magazine; I’ve enjoyed reading every issue I’ve previously gotten my hands on. Print editions of every issue are available to order from the journal’s website. Please join us for Ish River Poets’ Circle: Sunday, December 15, 3:00-5:00 p.m., at Anchor Art Space, 216 Commercial Ave., in Anacortes, WA. I will be joining Jane Alynn and Caleb Barber in a poetry reading. Brad Killion and Jeff Winston will be putting music to some Robert Sund poems, and Jim Hart will share more of Robert Sund’s poems and discuss his time with Sund in San Francisco.I hope to see you there for a wonderful afternoon of art, poems, music, and conversation! Tea and cookies, too. Everyone, let me tell you about Kathryn Hunt. 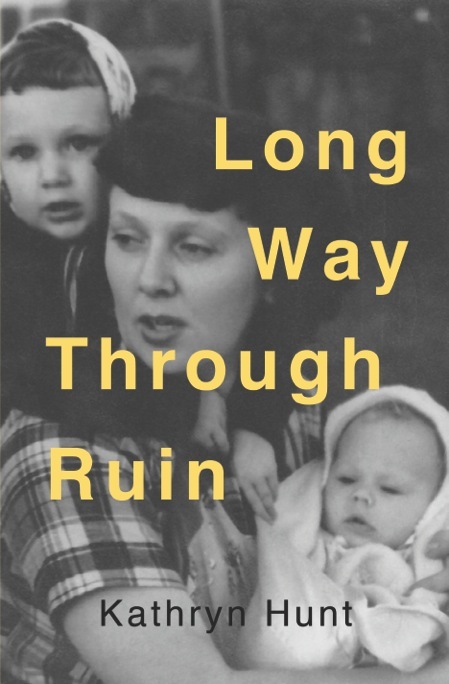 She’s a Port Townsend writer and filmmaker whose first collection of poems, Long Way Through Ruin, is out this fall from Blue Begonia Press. I’m thrilled to get to do a reading with her at Village Books in Bellingham, Washington, on Saturday, January 11, 2014, at 7:00 p.m. If you can get yourself to the upper-left corner of the Lower 48, please come and say hello! Have you ever heard a more gorgeous line than “The silvering clouds with their luster / of honey and despair”? You can read “Credo,” plus three other of Kathryn’s poems from her collection, here. More information about the Ish River Poets’ Circle: in addition to Jane Alynn and me, readers will include Bellingham poet Caleb Barber, author of the collection Beasts and Violins from Red Hen Press. As an added bonus, Brad Killion and Jeff Winston will be putting music to some Robert Sund poems during the intermission. The reading will be Sunday, December 15, 3:00-5:00 p.m., at Anchor Art Space, 216 Commercial Ave., in Anacortes, WA. Please join us if you can! I’d love to see you there. Ish River Poets Circle on December 15, 3:00 p.m.
Two Sundays from now, I’ll have the pleasure of joining the Ish River Poets Circle at Anchor Art Space in Anacortes, Washington to do a reading with Anacortes poet Jane Alynn. “Ish River” refers to the title of beloved Skagit County poet Robert Sund’s collection Poems from Ish River Country–the “Ish” meaning “river” in the Coast Salish dialect spoken by local tribes. (Sund’s poems pointed to many rivers along the Puget Sound ending with this watery syllable: Samish, Snohomish, Skykomish, Stillaguamish.) The Ish River Poets Circle–a reading series initiated by Robert Sund while he was still alive–presents poets whose work, together, creates a poetic conversation. I’m excited to participate in this reading format with Jane Alynn, author of The Necessity of Flight (Cherry Grove, 2011). See more about her collection here, as well as three of her exquisite bird poems here. The reading will be at 3:00 in the afternoon at Anchor Art Space, 216 Commercial St., in Anacortes, WA. If you’re in the area, please come!